It’s August 2013 and the trio of Dan Ghenacia, Dyed Soundorom and Shonky are coming to the close of an eight-hour showcase of their trademark deep, groove-laden house music at their second all-night long DC-10 party as Apollonia. 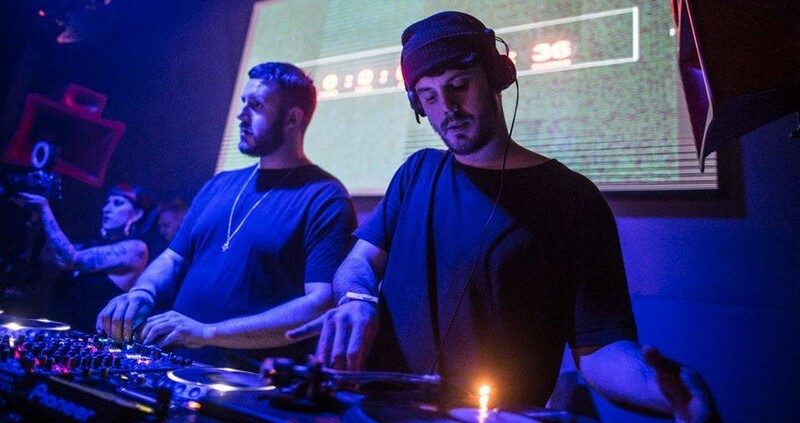 The Ibiza club is at capacity, and it’s the middle of what’s already been a huge summer for the three Frenchmen, which has seen them release their first EP as a collective on their self-titled label, as well as mix the ‘fabric 70’ compilation. They’ve just dropped Matthew Herbert’s Tasteful Mix of Moloko’s ‘Sing It Back’ and, despite being a relatively low-key track, its deep sunken bassline ignites the dancefloor. At that moment, the trio realised that many years of hard work had come to fruition. Despite what some might believe, with Ghenacia, Soundorom and Shonky only forming the Apollonia collective in 2012, success hasn’t come almost overnight. The trio first met at after-parties at the La Batofar boat venue in Paris during the late '90s. There, Soundorom played a selection of avant-garde house music bathed in the psychedelic grooves of the US West Coast, inspired by artists released on Grayhound Recordings as well as often forgotten legends like Mark E Quark. Almost 20-years later, the Parisian scene is now rife with DJs, producers, labels, crews and parties all pushing music with a clear lineage back to those La Batofar days. And it’s not just people in Paris getting behind the sound. Since that party in 2013, the music has caught the attention of some of Ibiza’s biggest nights. Apollonia are doing a number of all-night long sets at Marco Carola’s fabled Music On at Amnesia, Djebali was drafted in for the opening of ANTS at Ushuaïa alongside John Dimas, whilst DC-10’s Circoloco has become ubiquitous with French purveyors of the trippy after-hours house music that has become the sound of the summer. It’s fair to say, France is having a moment. The road to taking their music out of the after-parties and towards the world’s biggest venues can be traced back to Ghenacia starting his Freak N’ Chic label in 2002, running parties with residents including his two Apollonia co-founders, and a network of French DJs including D’Julz, Terence: Terry:, Franck Roger and Phil Weeks. Towards the end of that tenure, they also started doing parties at DC-10. The label ceased after eight years, with the Apollonia collective rising from its ashes, but the foundations had already been laid for the island to fall for their intoxicating blend of timeless music, which pulls from Ghenacia’s favoured US West Coast house, permeated by New Jersey sounds like Kerri Chandler, a universal appreciation of the disco music their home country pioneered through Cerrone and clubs like Le Palace, minimal techno, and early Chicago and New York house. It may have taken the rest of the world until now to catch up, but through Freak n’ Chic and their parties at La Batofar, the artists around the label have been chipping away for almost two decades. And although the sound is everywhere on the White Isle this summer, nowhere has taken the hypnotically deep and dubby house to their heart quite like the Parisians. And it’s a combination of factors which led to this moment. At a time that many young people had grown tired of the electro sound that had been dominant in Paris’ biggest venues, the government, who had placed restrictions on the night-time economy after the free party scene of the '90s, were beginning to see the benefits of allowing events outside of clubs again. That paved the way for the likes of the open-air Sundae parties at Café Barge, as well as a number of other collectives like Sonotown to plan raves in warehouses and unused spaces across the city. It was the perfect storm, and essentially lit a fuse under a dormant scene. The introduction of Concrete and their Weather Festival was another catalyst to driving this forward. Opened just 100m from where the Sundae day parties were hosted, everybody connected to the scene says the venue has had a huge impact since opening in 2011 under the creative direction of Brice Coudert. “After the '90s, the government were scared about this new movement, whilst the media turned out all the clichés about drugs,” he explains. And he can’t be complementary enough about Ghenacia and all involved at Freak n’ Chic. One of the younger artists to rise through the ranks of the new wave of French house is Mehdi Djebali. After getting the support of Terence :Terry: early in his career, who put the Parisian on at his After Party Is Not A Crime night at Rex Club, he then became a resident during the final years of Freak n’ Chic at La Batofar. He says the collaborative nature of the city’s scene has done a lot to push it forward. Ralph Maruani (aka Flabaire) is the co-founder of one of the new crews Djebali speaks of, who are beginning to make waves on the Parisian scene with a “French chic” through his D.KO Records; a collective of young producers in their early 20s that include Mézigue and BrAque. They are also involved with Paris’ 75021 parties, run by the Sonotown collective in a former social housing building that’s now been turned into an arts space. But the scene of artists playing and producing deep and groovy house is by no way limited to Paris. Shonky and Dyed Soundorom have both lived in Berlin for nine years, after growing tired of the city whilst deep house was first having an impact in the German capital. And Mandar, the collective whose label Oscillat Music has become increasingly prolific since its inception in 2014, is made up of Lazare Hoche from Paris, Malin Genie from Amsterdam and Samuel Andre Madsen (aka S.A.M.) from Copenhagen. They met through sharing music on social media, and bonded over a mutual appreciation of the emotive music they now produce as a trio. Hoche says there are suddenly collectives cropping up all over France too, with Jardin Suspendus taking French artists like Point G and Le Loup, and international names including Kerri Chandler and Lil Louis, to their rooftop in Marseilles, as well as labels like Mad in Lyon and Art Feast starting in Lyon, art collective La Verger running parties in Bordeaux, and vibrant scenes in Nantes, Montpellier and Lille. It’s also starting to shift into the UK. Birmingham-born Lopaski has been warming up for a number of French house DJs through his residency at the city’s The Rainbow Venues, known himself for spinning an elegant brand of house music. His productions subsequently garnered the attention of John Dimas’ Elephant Moon label earlier this year, who released his ‘Trinity’ EP on wax in February. Liam Willers, of Egg London’s residents The Willers Brothers, agrees. “Because most of this stuff isn’t commercial music, it hasn’t been in the Beatport charts,” he explains. “That means within the UK there haven’t been many of us playing the sound, which is why people are amazed they don’t know what a lot of the music is, even though many of these guys are now on top,” adds Sean. The agency Willers is talking about is the “entertainment developer” launched by Apollonia man Dan Ghenacia seven years ago, which represents a number of the scene’s key players including Djebali and Terence :Terry:, as well as supporting newer talent like Molly and Nicholas Lutz. It’s an unsung hero, but something that has affirmed Ghenacia as the kingpin of Paris’ underground music for those within it. But the artists they represent aren’t restricted to France. Diego Krause, who is one of the driving forces behind Berlin’s Beste Modus label, was recently signed up to the agency. Krause started Beste Modus with a collective of artists that includes Cinthie. And the label now collaborates with Parisian imprints including Rutilance Recordings, and others pushing a similar sound outside of France like Berlin’s Unison Wax and London’s Axe On Wax. She says they started Beste to bring house music back to Berlin. “We’re only playing the smaller clubs here,” Cinthie explains. “As we still can’t compete with Ben Klock.